December 2016: I completed another Beegie Adair: "Begin The Biguine" (6 pages). November 2016: I completed the transcription of "Tangerine" by Beegie Adair in trio, and a good version of the Richard Rodgers song: "Manhattan" by the swiss pianiste Pascal Wintz. October 2016: I transcribed a Cole Porter song:"Dream Dancing" interpreted by Beegie Adair; then I completed the transcription of a blues by pianist Anthony Ghirardelli: "T'aint Nobody's Business If I Do".Then back to Bill Evans with an extract from "Together Again" with Tony Bennett:"You Must Believe in Spring". I also transcribed two other B. Adair recordings: the piano rendition of a french song: "If You Go" ("Si tu partais" by Michel Emer), and "Embraceable You". September 2016: I made two other Peter Nero transcription: "Are My Dreams Real ?" and "Love Is a Many Splendored Thing"
August 2016: I completed the transcription of "I'll be Seeing You" by Peter Nero. June 2016: I transcribed the first chorus of the Keith Jarrett recording of "I'm Gonna Laugh You Right Out of my Life" and "Body & Soul" Then I completed the transcription of "I Remember You" by Beegie Adair, a swinging trio version of this classic from her album "Days of Wine and Roses", and started to work on her recording of "The Way You Look Tonight". May 2016: I transcribed the trumpet, trombone and sax. parts from "Park Avenue Petite" by the Benny Golson ensemble. Then back to Bill Evans with the transcription of "Spartacus Love Theme" ("The Solo Session vol. 1, 1963), a theme he recorded also the following month for "Conversations with Myself". After that I started transcribing a very good interpretation of "I Remember You" by Beegie Adair. April 2016: I transcribed "You're Gonna Hear From Me" from the recent Bill Evan CD "Some Other Time". Then I made a complete transcription of two pieces by Peter Nero: "As Long As He Needs Me" and "All I Ask of You". Then three other Bill Evans: "Up With the Lark" from "the Sesjun Radio Show" album, "Waltz For Debby" from the Tony Bennett - Bill Evans album, and "All The Things You Are" from "The Solo Sessions Volume Two" (Jan. 10 1963). March 2013: I completed a new Bill Evans transcription: "I Fall in Love Too Easily", a ballad from the album "Moonbeams". October 2012: In the Bill Evans "Practice Tapes" CD 2, the #3 is presented as"The Two Lonely People" only, but there are two other tunes: an unnamed and incomplete composition, followed by "Waltz in Eb", which is in my Bill Evans Fake Book and has not been recorded officially by Bill Evans. So this is the only existing recording, as for the following tune, #4 : "Unnamed composition" which is actually "Chromatic Tune", whose lead sheet is presented too in the Fake Book. One can hear it played by Chick Corea in his Cd "Further Explorations" but under another title: "Song N°1", I don't know why. October 2012: I confirm what is suspected from the beginning: the Bill Evans CD "THE VERY LAST PERFORMANCE" at Fat Tuesday's - september 10, 1980 is a fake. I checked four tunes which are simply "borrowed" from the box-set "Turn Out The Stars" - the final village vanguard recordings, june 1980: If You Could See Me Now (CD 4), Letter to Evan (CD 1), Like Someone in Love (CD 6), and Time Remembered (CD 3). I did not identify the other tunes yet, but it is highly probable they come from other sources. September 2012: I made the transcription of a nice piece by Keith Jarrett: "Radiance part 13", from his concert in Osaka (Oct. 27, 2002): "Radiance", CD 2. August 2012: I transcribed the superb intro of "Nardis" from Bill Evans concert at Molde Jazz festival, August 1980, probably one of the best among the so many versions ! March 2012: I wrote an article for "Clavier Companion": "How do you decipher rhythms when transcribing the recordings of Bill Evans ?" where I talk about the difficulties of transcribing piano music: www.claviercompanion.com April-March, pages 58, 59, 60. February-March 2012: Still transcribing, I achieved two complete transcriptions: "Some Other Time" from The Bill Evans album: "Everybody Digs Bill Evans", with its famous left-hand ostinato used again in "Peace Piece" and "Valentine", a nice composition by Fred Hersch played as an encore at the end of his concert in Barcelona, October 2010. December 5, 2011 The creation of "Exercice de Concert" (Martial Solal-Pascal Wetzel) has been given by pianist Eric Ferrand N'Kaoua at the end of a beautiful concert "From Franz Liszt to Martial Solal" at Théâtre du Gymnase in Paris. October 2011: I transcribed a very nice excerpt (4'05) from the Keith Jarrett solo concert at the Tokyo Metropolitan Festival Hall (October 30, 2002). September 2011: I made the complete transcription of "Easy To love", a great solo piano by Bill Evans from the album "Conception". June 2011: I achieved the complete sheet music of a piano piece by the french virtuoso Martial Solal, entitled : "Exercice de Concert", 17 pages of music, very much in the manner of his piano "Etudes" already published.. Many notes as usual with Martial, who plays with bitonality all through, and a real challenge for the transcriber. 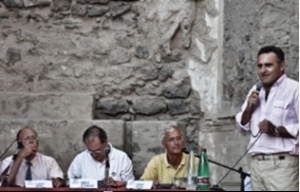 September 2010: Enrico Pieranunzi has organized on September 4-5 a colloquy on Bill Evans during the Ischia Jazz Festival (Italy). 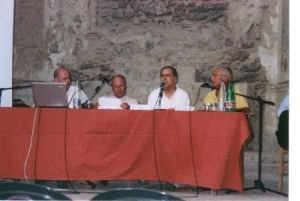 The participants were: Vittorio Castelnuovo, journalist, Ludovic Florin, musicologist, Claudio Sessa, jazz historian, Enrico Pieranunzi, and myself. An opportunity to share different outlooks on Bill Evans's music. 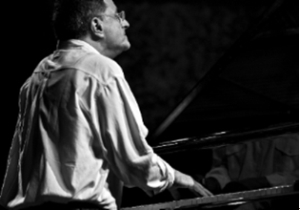 Presented by Enrico, Eddie Gomez played in concert with Antonio Farao and André Ceccarelli (photo). March 2010: The brilliant Fred Hersch made in 1990 an album-tribute to Bill Evans: "Evanessence". A remarkable soloist, he also excels as a partner of singers. I made the complete transcription of his accompaniment for Janis Siegel in "For No One", the Beatles song - "the centerpiece of the album" says Fred - arranged for their CD: "Slow Hot Wind"(1995). June 2009 I achieved recently the complete transcription of People the long and superb piano solo (13:26) from "Alone Again" remarkable for at least one reason: Bill Evans doesn't improvise at all but play the theme not less than eight times, alternating the keys of Bb and E (tritone relationship). Twice he is near to conclude, but he changes his mind and goes on in a different mood and tempo. His left hand supports in a masterly manner the full harmonic treatment given to the piece that can be considered to be the touch-stone of this splendid album.The transcription was a real challenge: twenty pages of music played rubato, with some very fast left-hand lines. I finished in 2008 the complete transcription of Never Let Me Go, the very long and wonderful piano solo from "Bill Evans Alone" recorded October 21, 1968 (I had transcribed the first theme only for my first book, "The Artistry of Bill Evans"): twenty-three pages for a 14mn28 masterpiece. I did also -Feb. 2009- the complete transcription (sixteen pages) of a 10mn piano solo: Danny Boy, the traditional irish theme played by Bill Evans in three different keys: Bb, B, and F, a device he used quite often to revive the interest. This solo was recorded April 4 or 10,1962, and released on the album "Conception". I have completed the transcriptions of four tunes from You Must Believe In Spring: The Peacocks, Gary's Theme and Theme From M*A*S*H. (complete transcriptions) and the bonus track Without A Song (Theme only). So I have transcribed the entire album , one of the greatest Evans trio recordings: it would make a great book !